Brown - Protection of Animals, Earth Magick, Stability, Nurturing & Grounding. Magenta - Quick Change - use this candle with other candles to initiate a quick response or fast changes. Once you have selected your candle it has to be oiled or "dressed" before burning. The purpose of dressing the candle is to establish a psychic link between the candle and you. By physically touching the candle during the dressing procedure, you are charging it with our own personal vibrations whilst concentrating the desire of your magickal act into the wax. The candle is becoming an extension of your mental power and life energy. 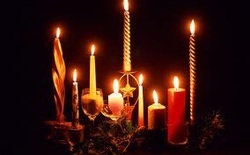 * To draw something toward you, rub the candle in a downward motion from the top to the middle. Then rub from the bottom up to the middle as well. * To repel something, reverse by rubbing from the middle to the ends. TIP: Never rub in a back and forth motion, it negates the entire process.Firstly you need to speak words of power over the candle e.g. "I cleanse and consecrate this taper in the name of the God and Goddess. May it burn in strength in the service of light"
Then you need to state the purpose of the candle. 1/ verbally by preparing and then repeating an affirmation. 2/ by writing your intention on the candle or a piece of virgin paper.